Port Moresby, situated on a scenic harbour is the gateway to your PNG adventure holiday. The city got its name from Captain John Moresby who was the first European visitor to arrive in 1873. As the largest city (pop. approx 320,000), capital and main commercial centre of Papua New Guinea, Port Moresby is also the central meeting place for people from the various provinces, who come to town to purchase their supplies and exchange news items. Due to domestic flight schedules an overnight stopover in Port Moresby may be necessary. For this we recommend The Gateway Hotel or the Holiday Inn. 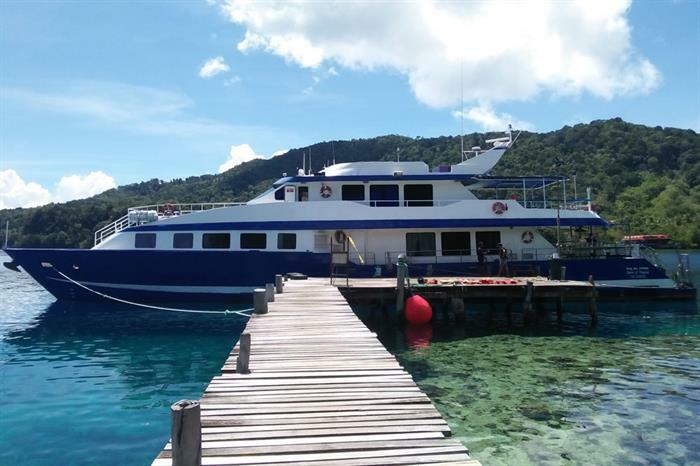 For those wanting to dive and explore the area surrounding Port Moresby, Loloata Island is located out in Bootless Bay, just a 15 minute car ride followed by a 10 minute water taxi transfer from Port Moresby International Airport. Port Moresby is located on the shores of the Gulf of Papua, on the southeastern coast of the Papuan Peninsula of the island of New Guinea. Its location made it a prime objective for conquest by the Imperial Japanese forces during World War II, as a staging point and air base to cut off Australia from Southeast Asia and the Americas. Port Moresby refers to both the urbanised area of the National Capital District and more specifically to the main business area, known locally as "Town". The original colonial settlement was by the water and is still the port area, as well as the main business and banking district. On the hills above town are upmarket residences. Closer to the airport, separated from the original town by hills, is Waigani, a 1970's development built to house the Government offices of the newly Independent (September 16, 1975) country of Papua New Guinea. Nearby are the housing areas of Boroko and Gordons, which also contain most of the large stores. Port Moresby has some security problems including theft and attacks by criminals. Fences and walls are considered necessary around houses and apartment buildings and security guards are widely employed. A visit to Parliament Haus, PNG’s most impressive building with its detailed mosaic facade, and the cultural displays at the National Museum are recommended. Port Moresby Nature Park (formerly The National Botanical Gardens) is a highlight. The Park has some amazing examples of PNG wildlife such as birds of paradise, cassowaries, tree kangaroos, multiple wallaby species, and many other native bird species. The gardens are well kept, lush and tropical and the orchids are beautiful when in bloom. There are some good restaurants in Port Moresby and a nice golf course across from the government buildings. The Ela Beach Craft Market is held on the last Saturday of each month, bringing together local artifacts from all over Papua New Guinea. Shop for beautiful paintings, carvings, handwoven baskets, shell jewelry or any number of other artefacts to bring home as souvenirs. Outside town, Varirata National Park is heaven for bird-watchers and the drive there is rewarding. Diving is run all year round and even during bad weather some dive sites are still accessible. Water temperature ranges from 25 degrees C (76 degrees F) in August and September up to 30 degrees C (86 degrees F) in March and April. We advise divers to wear a Lycra skin to prevent sunburn and stings. During the cooler months a 3mm wetsuit or thicker is recommended. The sea is usually relatively calm, but the visibility declines through the wet season. The sea is usually calm and the visibility begins to improve. Southeast trade winds blow at this time, making the sea sometimes quite choppy, the visibility is quite good. This is when the best diving is to be had with calm seas and good visibility. Loloata Island offers immediate access to The Papuan Barrier Reef. There are over 30 dive sites to explore including walls, drop offs, reef channels, drifts, coral bommies as well as 3 ship wrecks and wreck of a WWII Boston Bomber. The surrounding reefs and islands provide the perfect nature study environment for marine biologists and those with an interest in rare marine creatures. Dive Loloata operates trips to Horseshoe Reef Marine Park. Their purpose built dive boat can cater for all your diving needs. Scuttled in 1982 for sport divers, this 25 metre steel prawn trawler lies with her masts in 15 metres and her keel in 27 metres. Her masts are thick with black corals, soft corals and tubastraea trees. Cardinal fish swirl amongst the corals in the open doorways at the base of the mast. There are good quantities of fish life on and around the wreck. Red lined anthias and Harliquin ghost pipefish are found here. This site is protected in most weatehr conditions. Rhinopias (Merletts scorpionfish) and crocodile flathead are often found here. Walls covered with gorgonian fans, pink seawhips, tubastraea and soft coral trees. A falling tide brings vast quantities of fish life to feed in the current. Pygmy seahorses are not uncommon. A perfect safety stop at the anemone garden with the anemonefish before ascent. Depth: 6 - 20 metres. Sheer wall with large gorgonian fans in deeper water. There is a chance of seeing sharks and rays due to this site being situated on the ocean side. Can be a great dive at the point of the wall with the current running. The shallow top of the reef ranging from 8 - 10m deep is covered by hard corals galore and often a Napoleon wrasse being sighted. Abundant fish life, including pygmy seahorses. Pristine bommie situated on white sand. Plethora of corals and fish life. Superlatives cannot describe this dive site. Good site for pygmy seahorses. Depth: 12 - 30 metres.